WFAA anchor John McCaa announces his retirement after 42 years in the television news business. After 42-and-a-half years in television news — seven-and-half-years at WOWT-TV in Omaha, and nearly 35 here at WFAA – I intend to retire in March of 2019. Am I ready? In some ways yes, in some ways no. Management has graciously asked me to stay longer; I’ve politely declined. It’s not easy to step away from a business in which you’ve worked two-thirds of your life, and loved even longer. However, I’ve always accepted it as true that God gave me the opportunities I’ve had in this field — and no one could keep them from me — but that when God decided it was time for me to quit, there would be nothing I could do to successfully continue in this profession. Having sensed that it’s that time, I’m of my own volition, obediently stepping away. Among all our on-air people here at WFAA, I’m very likely the most private. I absolutely hate to do selfies and believe the most useful aspect of social media (for me) is not its ability to share “stuff” about myself or my family, but to quickly disseminate new, accurate information on stories and trends concerning the world around us. John McCaa in his Boy Scouts uniform with his mother. John McCaa with his parents on his high school graduation day. 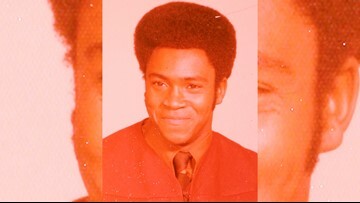 John McCaa at the time of his college graduation. 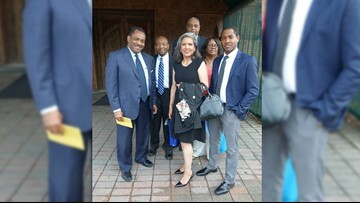 John McCaa with wife his father, wife, brother-in-law, sister and son. John McCaa with wife, Nora, at Lake Como. John McCaa with wife, Nora, at Tiananmen Square in China. Nora McCaa in Venice, Italy. John McCaa with wife, Nora, in Bellagio, Italy. John McCaa in Comfort, Tx. John McCaa with his wife, Nora, during a dinner on a Hong Kong cruise. I have nothing to hide, but I come from a very old-fashioned military family. I’m from Nebraska, where it’s generally frowned upon to talk about or promote yourself. (For those of you wondering … uh no, Dale Hansen, as he'll quickly tell you, is from Iowa, not Nebraska). During my more than four decades of reporting for and anchoring newscasts, I’ve always tried to maintain some level of separation between private and public life. It’s not easy while holding down the very public position of anchoring news broadcasts, but I always believed it was me who chose this public life, not my wife Nora nor my now adult son, Collin. They have the same right to privacy all others cherish. I’ve done my best to make sure they’ve had it. I learned as a kid that it’s almost always better to observe than to be observed. It was, and I think remains, sound advice for a young journalist — advice that encourages listening and looking rather than speaking and performing; witnessing and recording more than participating and interacting; and careful discernment to determine the difference between what is said and what is meant. Fortunately, our current executive news director, Carolyn Mungo, has, with the help of others, led a concerted effort by our reporters, photojournalists, editors, digital journalists and others to a return of just plain good storytelling in the form of our WFAA Originals. Those on-air projects require extra time and effort but consistently result in memorable experiences for viewers. They make our product stand out from our competition. I started in this business when stories were shot on film with either silent Canon “Scoopic” cameras or sound recording CP-16s that shot either 7239 Daylight, 7240 Indoor, or later 7250 16-millimeter film. It had to be developed via chemical process once you returned from the field while laid out on a table, then hand cut and spliced together to match the written script. And God help you if you didn’t check the glue used to splice it together—it would break on the air and you’d look like a real idiot. In longer stories, which are still referred to as packages, your narration was played on an audio cart that looked like an eight-track tape. Television news to me then was the one “campfire” around which a whole society could gather and learn about each other. Earlier generations could make that argument about newspapers, radio and other media, but for me it was television. It had the potential of being a place that could dispel rumors about people you never saw and communities with whom you never came in contact. It has not always lived up to that ideal. As a kid, every time I saw black folk on TV news, they were involved in crime-related stories. I had no relatives or friends like that. There was also on TV news, I thought, a too common tendency to point to a veteran’s service in Vietnam as a reason some committed crimes. The benefit of growing up living on military bases was that you did live around socially diverse groups of people and veterans. That didn’t completely isolate you from society’s troubles. Racism, sexism and homophobia were evident. However, experiences like that, which I did encounter — and there were more than a few — were far offset by the close friends with whom I attended Madrid and Torrejon high school outside of Madrid, Spain. I had friends of every race, religion and political persuasion, many speaking more than one language and who treated each other with a dignity and respect most people today still need to learn. I listened to James Brown, Jimi Hendrix, Gil Scott-Heron, Sly Stone, Led Zeppelin, War, Deep Purple, ELO, Ray Price, Temptations, Tower of Power, The Who, Richie Havens, Miles Davis, Earth Wind and Fire, Weather Report, Santana, and many more. 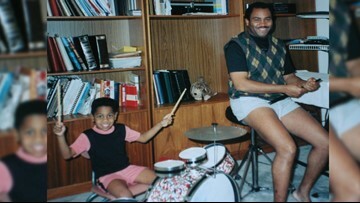 I was attracted not by the race of the performer but by the power of their lyrics and musicianship. This has been a wonderful journey for me. As a matter of fact, it’s been an overwhelmingly fortunate journey, having worked for six exceptional news directors: Steve Murphy in Omaha, and Marty Haag, John Miller, David Duitch, Michael Valentine and now Carolyn Mungo at WFAA. Some stories mark you, good and bad, for life. Thirty-one-years ago, now retired photojournalist Russ Bauman arrived at a fire in Arlington perhaps 30 seconds behind the first fire truck. We watched as brave firefighters broke out a second-story window, climbed in and one-by-one pulled four children out of the smoke-filled apartment building. They laid them down in the grass in front of us and desperately worked to revive them. The oldest, I believe, was 5. Not one of those children survived. From that time to this, about once a month in my dreams, I’m haunted by their innocent, lifeless eyes. I can still remember the strange smell of Manhattan two days after the 9/11 terror attacks. Standing outside New York City hospitals, a sea of strangers handed me photocopied pictures of missing loved ones, begging me to ask doctors inside if they’d seen them in treatment. But I also have fond memories, including nearly breaking down on the air after a particularly poignant story about the love Tracy Rowlett and his wife, Jill, shared for their son Michael, who has special needs. They spoke so lovingly of their concern for his future. There was also the time photojournalist Tim Auman captured the story of a Tarrant County Meals on Wheels volunteer, who was living in worse conditions than the people to whom she delivered meals, and delivering them via a barely driveable automobile. The next day I found out contractors who saw that story showed up at her home to make repairs, fix her car and give her money. What a blessing to breathe the same air as those kinds of Texans. It has been a privilege and an honor to be welcomed into your home through the broadcasts and programs I’ve anchored — the 10 p.m. news since 1992, and other broadcasts since 1988. We’re still a few months off from my final goodnight. After that, I look forward to throwing stuff at the TV when journalists get it wrong, as I’m sure many of you do now when it’s my face on the screen. As Nora will tell you, I’m already getting in some good practice. In retirement, we hope to sit at home together — reading, writing and listening to much more music (and for me, playing a little music). Our plan, right now, is to move south to San Antonio or the border area, closer to in-laws. I hope to do some community work and university level teaching. It took seven hard, hard years to get that PhD, I might as well put it to good use. We shall see what the Almighty has in store for us.